The mallard is the most common duck that we see here in Minnesota. They have a very wide range, which includes most of North America, Europe, northern Asia and northern Africa. They have also been introduced into Australia and New Zealand. They are a large duck weighing approximately 2 to 3 pounds. They are a dabbling duck so the can often be seen floating on the water like a bobber, with their tail on the air and their head underwater searching for aquatic vegetation to eat. There are several different varieties of mallards. There is the Mexican duck, which is found in Mexico and the southwestern United States, which is a subspecies of the mallard. The Hawaiian duck, found in the Hawaiian Islands is a separate species that is believed to have evolved from the mallard. 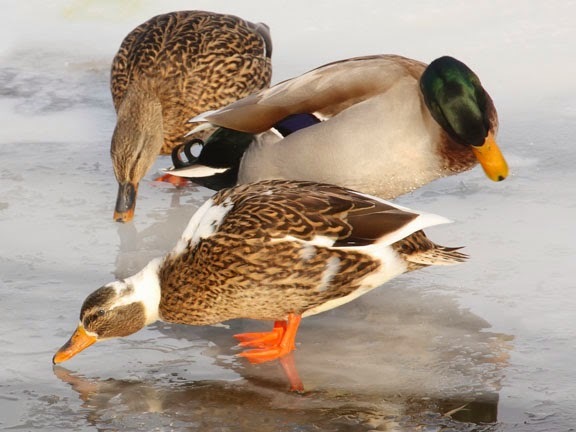 Mallards will also hybridize with other species of ducks. Mallards with breed with other wild ducks or domesticated species, most of who's ancestries can be traced back to mallards. The duck in the front of this photo is a female hybrid between a mallard and most likely a domesticated duck. male Mallards in their breeding plumage are beautiful birds. When I think of ducks, I ALWAYS think of this color scheme. I love mallards, one of my favorite birds - probably because I first saw one as a child. 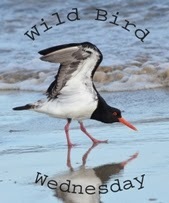 On my recent trip to Port Aransas on the Gulf Coast they were enjoying winter at the Leonabelle Turnbull Birding Center. 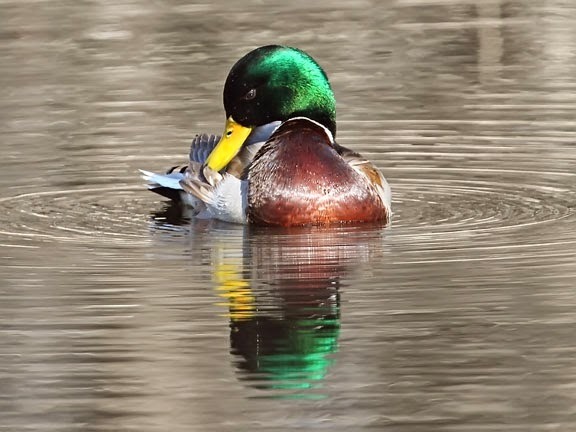 Interesting info re: mallards & their offshoots. I think they're a GREAT example of a v. common, so frequently overlooked species that is, in fact, GORGEOUS. And I seriously heart their so-bright-you-can-see-them-through-water orange feet. Very dapper dabblers.